On May 20, 2015, Dr. Staci Simonich and Dr. Kim Anderson presented to the Oregon State Air Toxics Science Advisory Committee (ATSAC). This committee is part of State of Oregon Department of Environmental Quality (DEQ) Air Quality Division Environmental/Technical Services. ATSAC is currently setting ambient air benchmarks for PAHs, as well as diesel and particulate matter. Dr. Simonich (Project 5 Leader) presented on”Monitoring PAHs in Ambient Air, the Big Picture.” Dr. Anderson (Project 4 Leader) presented on “Challenges of PAH Analysis and Availability of Standards”. Both provided an overview of their research programs, as well as addressed specific technical issues for the Committee. Dr. Dave Stone (RTC Co-Leader), who is a member of ATSAC, reiterated the value of both presentations, as well as the overall contribution of the Superfund Research Program at OSU in assisting the State on important public health and environmental issues. Posted in Events, Research Translation. 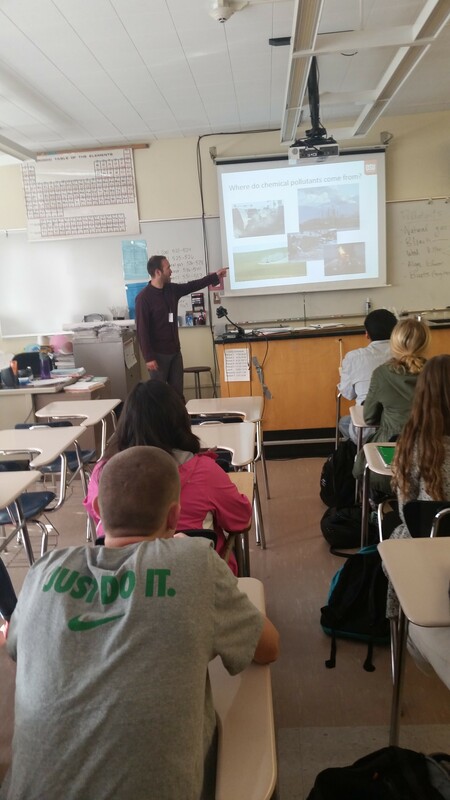 Blair Paulik and Jamie Minick, both SRP Trainees working on their PhDs in Dr. Kim Anderson’s lab (Project 4), traveled to McNary High School in the Salem, OR area on April 10th to teach students about environmental pollution. This opportunity was initiated when a teacher from McNary contacted the Community Outreach & Engagement Core of the Environmental Health Sciences Center (EHSC). The opportunity was then given to the Department of Environmental & Molecular Toxicology’s graduate student organization, TEAM Tox. This is a great way for grad students to get out into classrooms. Blair and Jamie’s interactive presentation highlighted where environmental pollution comes from, why environmental pollution is of concern, how humans are exposed to pollutants, and how scientists at Oregon State University are studying pollutants in the environment. Jamie Minick presenting on environmental pollutants. Throughout the day, Blair and Jamie taught 129 high school students from six different classes including chemistry, biology, and environmental science. 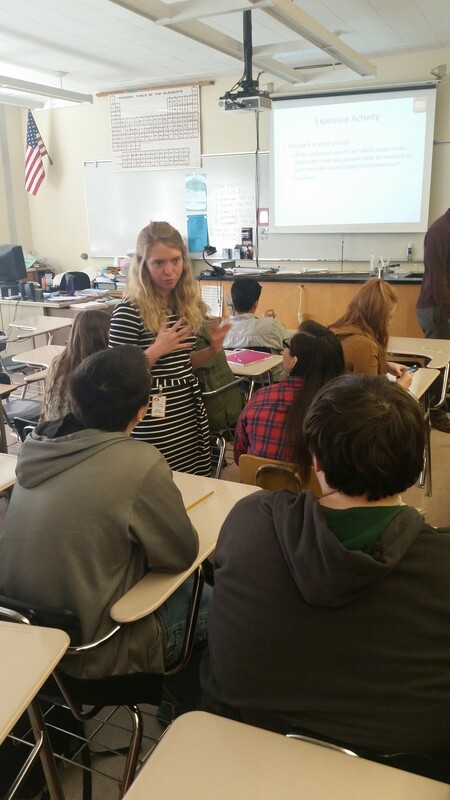 The students showed genuine interest in the subject matter, asking questions about specific environmental pollutants and about science and college in general. Posted in Science Communication, Science Education, Training. My name is Holly Dixon, and I am a new PhD student in the Dept. of Environmental and Molecular Toxicology (EMT) at Oregon State University (OSU). I grew up in Lake Oswego, Oregon and completed my undergraduate degree in Biology at the University of Puget Sound in Tacoma, Washington in 2014. During my undergraduate career, I had the opportunity to complete a nuclear forensics internship at the Los Alamos National Laboratory (LANL) and a chemical mixtures internship at the Pacific Northwest National Laboratory (PNNL) through the U.S. Department of Homeland Security. By completing summer internships, I not only discovered that the field of toxicology is the perfect blend of my biology, chemistry, and research interests, but also that one of my career goals is to better understand people’s environmental exposure to toxicants. I am excited by all of the opportunities I have had at OSU so far – both in my classes and research. I cannot wait to gain more specialized knowledge in toxicology and take part in a long-term research project. Through the EMT program’s supportive and motivated environment, I know I will grow as a student, researcher, and collaborator. I am currently working in Dr. Kim Anderson’s lab and learning about her different SRP projects (Project 4). Recently I had the privilege of being recognized as an OSU ARCS Scholar. This award is for a new PhD student in the College of Agricultural Sciences. As an ARCS Scholar, I receive a stipend for three years to support my graduate studies. 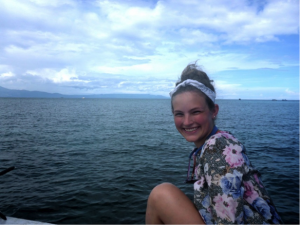 Outside of studying and conducting research, I enjoy playing tennis and exploring the Pacific Northwest. I look forward to spending the next few years in Corvallis. 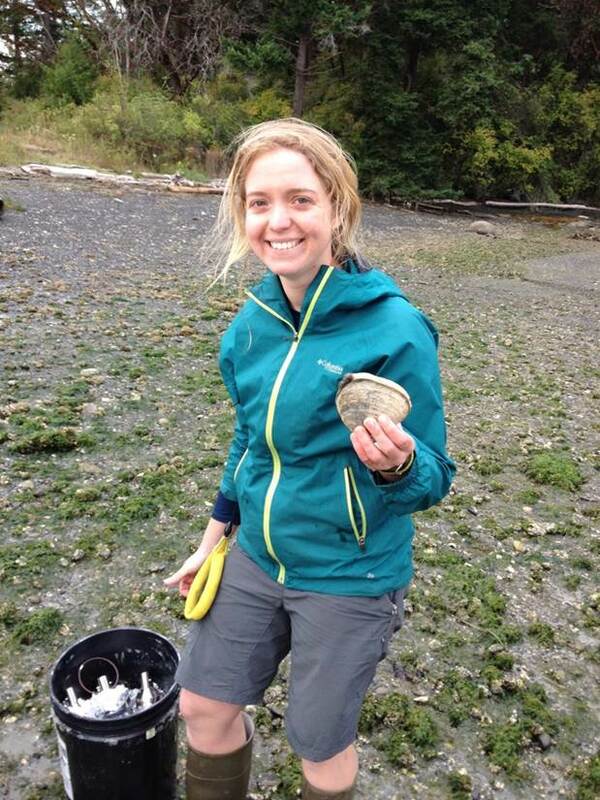 Blair Paulik out in the field with the butter clams. The Samish Indian Nation invited Blair Paulik (OSU SRP Project 4 Trainee) and Diana Rohlman (OSU SRP CEC Coordinator) to the 3rd annual Fidalgo Bay Science Conference on October 23, 2014. Our SRP presented a poster highlighting the recent butter clam sampling performed with the Samish and Swinomish tribal communities. In addition, governmental agencies, university researchers, citizen scientists and Tribal scientists presented on restoration projects (Custom Plywood Mill), the surf smelt spawning study (Salish Sea Stewards) and the Samish Natural Resources Program projects (Current Projects). Two Samish Tribal members opened the Fidalgo Bay Science Conference floor with song and traditional stories to explain the importance of a healthy environment. Tribal events such as this give our SRP Trainees valuable professional development experiences, exposing them to the history and culture of our Tribal partners and ways to work successfully with them. Paulik LB, Rohlman D, Donatuto J, Woodward C, Kile M, Anderson KA, Harding A. 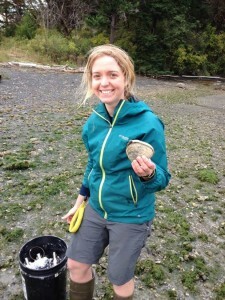 Improving techniques for estimating butter clam (Saxidomus gigantean) contamination in the Salish Sea. Poster presented at: Fidalgo Bay Science Conference, hosted by the Samish Indian Nation; 2014 October 23; Anacortes, WA. See the story “Tribes partner with OSU to study clam contamination” on the Northwest Indian Fisheries Commission web site. 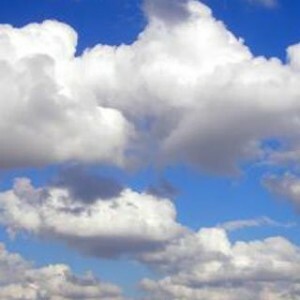 Posted in Community Engagement, Events, Research Translation, Science Communication, Training. Toxicologists examine the chemicals of modern life. Forty years ago, chemical pollution was the stuff that spewed from tailpipes, smokestacks, and sewers. Rivers burned, fish died, and forests withered under acid rain until Congress passed strict laws to curb the flood of manmade chemicals pouring into our waterways and atmosphere. Man-made and naturally occurring chemicals pervade modern life. Here are a few that have been linked to human health problems. However, 40 years ago there was little consideration of the chemicals that we were pouring into our bodies. The chemicals we use to sanitize our hands, package our foods, and keep our beds from going up in flames have seeped into our bodies in ways that were unimaginable a generation ago. Today, we are marinating in antibacterials, hormone disruptors, and flame retardants. Posted in In the News, Research.